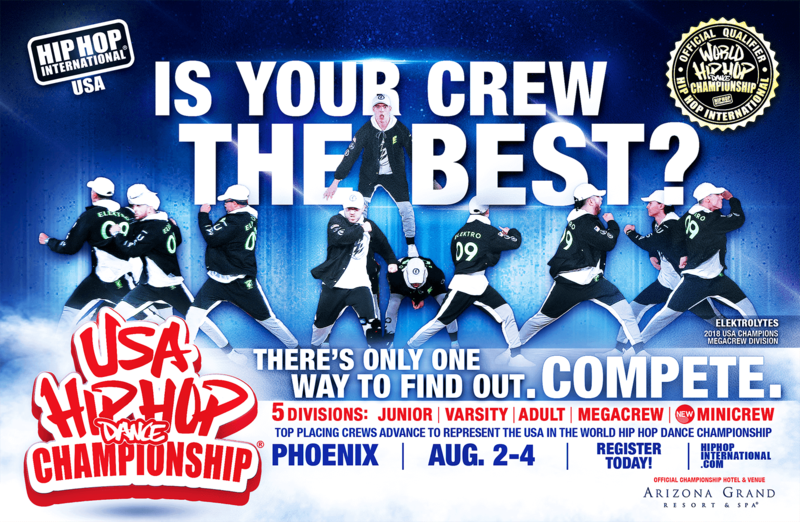 HIP HOP INTERNATIONAL INVITES ALL USA CREWS TO COMPETE THIS SUMMER IN THE #1 HIP HOP DANCE COMPETITION IN AMERICA! ALL USA CREWS ARE QUALIFIED AND INVITED – ALL YOU NEED TO DO IS REGISTER! Enter in Junior, Varsity, Adult, MegaCrew or MiniCrew Divisions to compete against crews from all over the United States for the chance to win the USA title. The top placing crews advance to represent the USA in the World Hip Hop Dance Championship where crews from more than 50 countries will compete for the World title. It’s an experience of a lifetime! • A crew consists of a minimum 5 to a maximum of 9 members. • A MiniCrew consists of 3 members. • A MegaCrew consists of a minimum 15 to a maximum of 40 members. • A crewmember whose age falls between two age divisions in the competition year (ending December 31) may compete in either division within that year. Example: A 12-year-old turning 13 by December 31, 2019 may compete in the Junior or Varsity division. Likewise a 17-year-old turning 18 within the competition year (by 12/31/2019) can compete as a Varsity or Adult. • Each participant’s proof of age (indicating date of birth) will be verified by HHI. Plan to stay the whole week. If your crew places in the top three positions in any division you will advance to compete against crews from 50+ countries in the 2019 World Hip Hop Dance Championship, August 5-10. USA crews not advancing to the World Championship will receive free entry into all World Hip Hop Dance Championship and World Battles events including the World Finals. The seven-days of street dance events include meeting and socializing with respected living legends and icons of hip hop dance, dancing in the Chill Down Lounge after the daily competitions have concluded, witnessing the presentation of the Living Legend of Hip Hop Award and participating in the Urban Moves Dance Workshops presented by the most celebrated hip hop dancers and choreographers, and shopping for the latest apparel and merchandise in Hip Hop International’s Marketplace. Above all you will make new friends and meet others from around the world who are equally passionate about hip hop culture and dance. The USA Hip Hop Dance Championship will be conducted under the official rules and regulations of Hip Hop International – see RULES & REGULATIONS.